Laminated glass can be designed to resist attacks by a wide range of weapons. There are many standards and test methods available. Almost all of these have two main requirements: (1) the glazing must resist penetration by a specified bullet and (2); the spall or flying shards of glass leaving the rear face, as a result of the impact, must be limited. 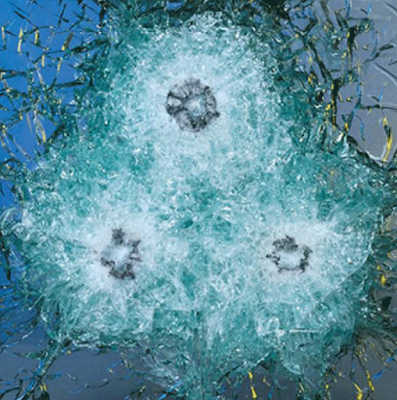 Bullet-resistant laminated glass can typically meet both of these requirements. Glass which slopes more than 15° from the vertical is considered sloped glazing by the major model building codes. 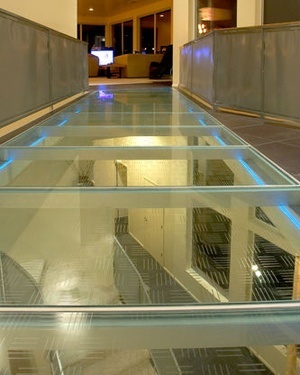 Laminated glass is the preferred product for sloped and overhead glazing, because the glass is retained in the opening, even when broken, reducing the possibility of injury from falling glass. Costly and unsightly screens are therefore not required. Laminated products are widely used in malls and in atriums in hotels and offices.